Ectopic heartbeats are small changes in a heartbeat that is otherwise normal. These changes lead to extra or skipped heartbeats. Often there is not a clear cause for these changes. They are mostly harmless. Ectopic beats may be caused or made worse by smoking, alcohol use, caffeine, stimulant medicines, and some street drugs. Ectopic heartbeats are rare in children without heart disease that was present at birth (congenital). Most extra heartbeats in children are PACs. These are almost always harmless. 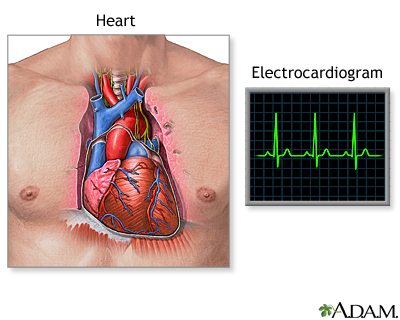 In adults, ectopic heartbeats are common. They are most often due to PACs or PVCs. Your health care provider should look into the cause when they are frequent. Most of the time no treatment is needed. A physical exam may show an occasional uneven pulse. If the ectopic heartbeats DO NOT occur very often, your provider may not find them during a physical exam. An ECG will be done. Often, no further testing is needed when your ECG is normal and the symptoms are not severe or worrisome. An echocardiogram may be ordered if your doctor suspects problems with the size or structure of your heart are the cause. Most ectopic heartbeats DO NOT need to be treated. The condition is only treated if your symptoms are severe or if the extra beats occur very often. The cause of the heartbeats, if it can be found, may also need to be treated. In some cases, ectopic heartbeats may mean you are at greater risk for serious abnormal heart rhythms, such as ventricular tachycardia. You keep feeling the sensation of your heart pounding or racing (palpitations). You have palpitations with chest pain or other symptoms. You have this condition and your symptoms get worse or DO NOT improve with treatment. Fang JC, O'Gara PT. History and physical examination: an evidence-based approach. In: Zipes DP, Libby P, Bonow RO, Mann DL, Tomaselli GF, Braunwald E, eds. Braunwald's Heart Disease: A Textbook of Cardiovascular Medicine. 11th ed. Philadelphia, PA: Elsevier; 2019:chap 10. Olgin JE. Approach to the patient with suspected arrhythmias. In: Goldman L, Schafer AI, eds. Goldman-Cecil Medicine. 25th ed. Philadelphia, PA: Elsevier Saunders; 2016:chap 62.